Return balance to union workplace entry laws by creating an enforceable code of conduct and removing union access to employee lunch rooms when other suitable meeting rooms are available. Click here for a summary of reform priority 2: Return balance to union workplace entry laws. Click here for a detailed explanation of this reform priority. Focus enterprise bargaining, and ensure legally protected strike action can only be taken over claims relating to the employment relationship, not union ‘wish lists’. Click here for a summary of reform priority 2: Focus enterprise bargaining. Expand agreement making options to facilitate employment arrangements, both individual and collective, directly between employees and employers. Click here for a summary of reform priority 3: Expand agreement making options. Reform unfair dismissal and ‘general protections’ laws to ensure employers are not forced to pay ‘go away money’ to settle claims without merit. Click here for a summary of reform priority 4: Reform unfair dismissal. Replace the Fair Work Commission with modern, balanced institutions by creating an Australian Employment Tribunal and a separate Employment Appeals Tribunal. Click here for a summary of reform priority 5: Replace the Fair Work Commission. AMMA has written to Minister for Employment Michaelia Cash raising serious concerns about the operation of Australia’s workplace relations tribunal and workplace relations laws. During the 2016 Federal Election campaign, AMMA wrote to every Member of Parliament to draw attention to 5 Urgent Workplace Reforms of significant benefit to the national interest. 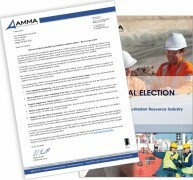 In April 2016, more than 100 of Australia’s leading resource companies employing over 85,000 people outlined their policy priorities in AMMA’s 2016 Federal Election Survey. AMMA published this booklet detailing our ‘Roadmap to Reform’ that would better support a viable, prosperous, job generating and globally competitive Australian resource industry. AMMA submitted a compelling case for workplace relations reform to the Productivity Commission’s 2015 review, based on the evidence and recommendations of our members. AMMA’s reforms are backed by KPMG research that examines competitive pressures on the Australian resource industry and the potential benefits of our proposed reforms. As the leading voice of Australia’s resource employers, AMMA ensures its case for workplace relations reform is represented in public policy discussions. Visit here for key news and media items.